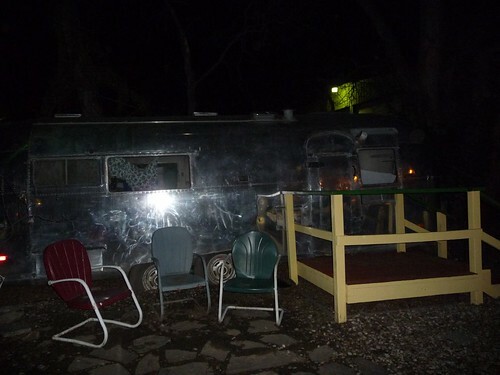 Mali Mish – Austin's obsession with Airstreams. On our trip we have stayed at many RV parks and campgrounds in many states across America. One of the most memorable and also highly recommended RV resort especially by fellow Airstream owners was Pecan Grove RV Park. 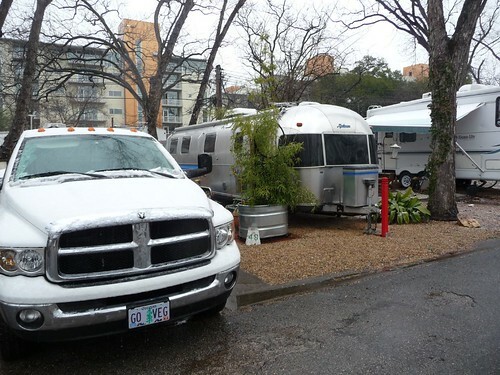 Pecan Grove RV Park is in the heart of Austin, Texas. 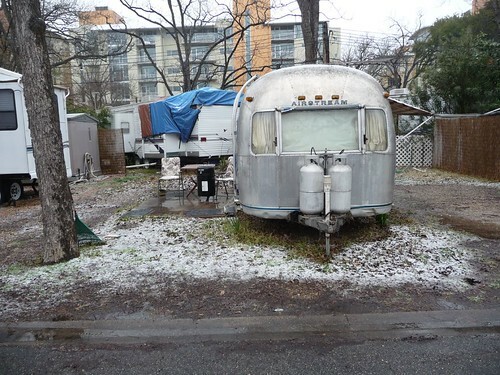 It is definitely a dying breed of RV Parks located right in the shadows of the Austin skyline. There were a couple of other RV parks near Pecan Grove that have already sold out to developers which many believe the owners of Pecan Grove will soon follow suit. Pecan Grove is a mixture of full-time residents with a handful of transients like ourselves and most people are very protective of their beloved RV park. Just as I walked around taking pictures of all the Airstreams in park, I was approached several times by both management and residents about what I was doing. Apparently its in-city location invites lots of lookie-loos who like to cruise through the park for good reasons or bad. This gentleman with half of his Dodge pickup hanging out the driveway was especially sensitive of having pictures taken of his trailer. He poked his head out of his door asking if I needed any help as I was standing across the way snapping a pictures for the blog. 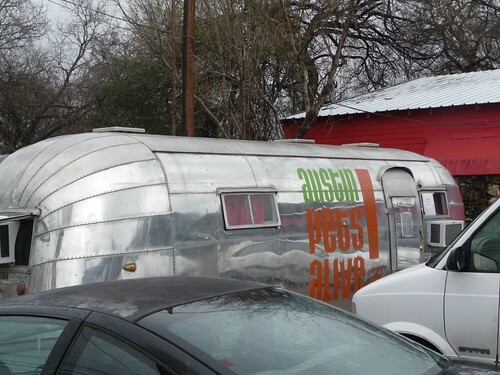 As we drove around Austin, we quickly learned that the Airstream obsession does not stop at Pecan Grove. Apparently the entire city if Austin is under some type of Wally Byam voodoo spell. 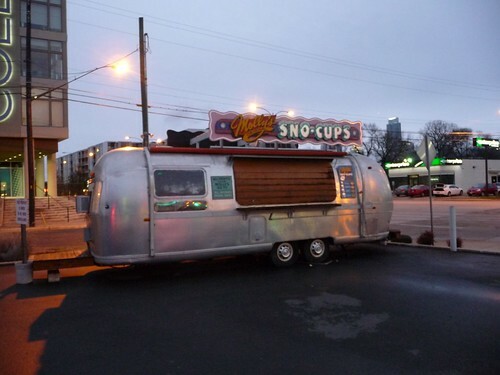 Just around the corner there is a sno cone shop in an Airstream. Down the street from us is a pet adoption shop in an Airstream. 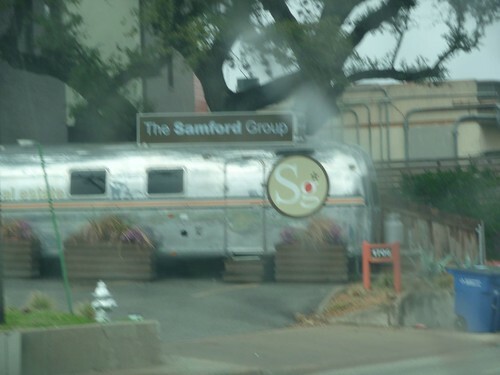 Across the street from that is actually a law firm in an Airstream. Couple blocks away from the law firm we have a donut shop in an Airstream. 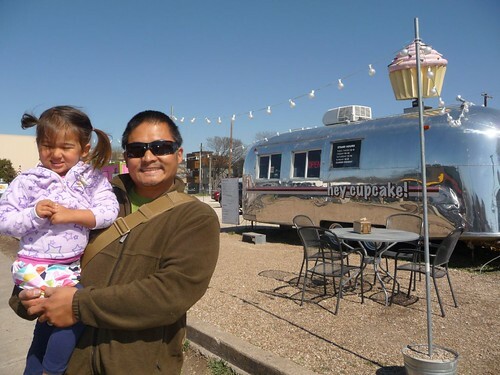 And of course there is the famous hey cupcake bakery in an Airstream. 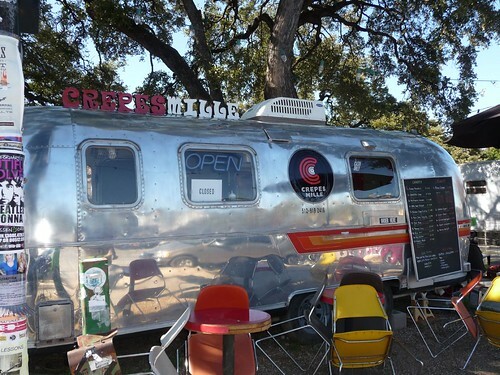 Just when we thought there couldn’t be any more doughy goodness made inside the silver bullet, we came across crepes in an Airstream. Our last night in Austin, we patronized a restaurant called the Shady Grove within walking distance from Pecan Grove RV Park. 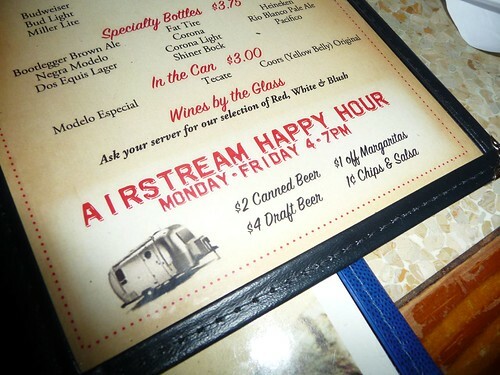 Of course, aside from having a couple of Airstreams in the outdoor seating area, they also feature a very popular ‘Airstream Happy Hour’. Photo Slide Show: Road Trip 2010 – South Florida Atlantic. Can you spot a full-time road tripper? 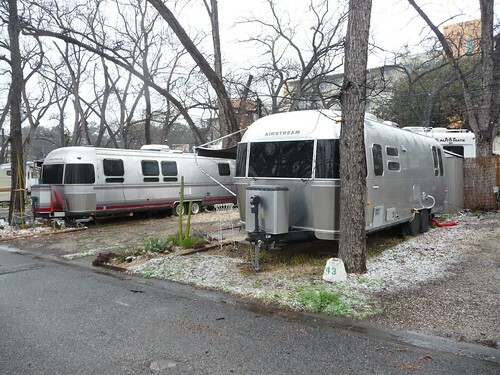 2 Responses to Austin’s obsession with Airstreams. hey! 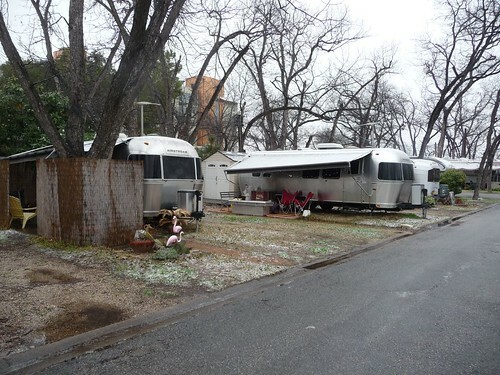 love all the airstreams in austin. 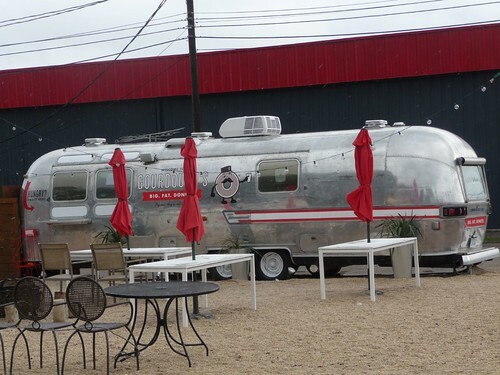 want to go to AIRSTREAM happy hour. am off to NOLA next week for jazz fest. road trip with friend-sadly NOT in an airstream. should be fun anyway. p.s. 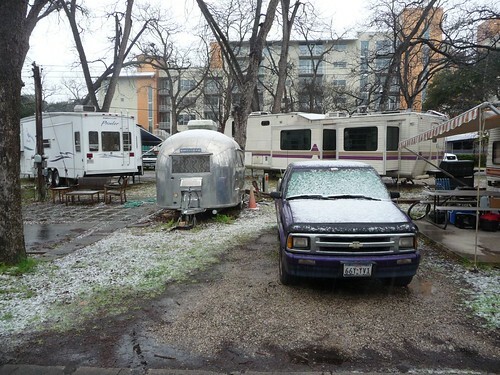 why is there SNOW in austin in april ?